Os grid reference SE 2085 6458. 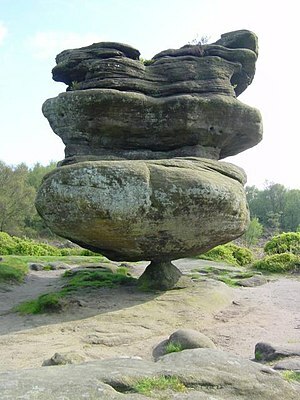 About 2 miles to the north of Summerbridge in Nidderdale, north Yorkshire, is Brimham Moor on which can be found the millstone grit outcrops known as Brimham Rocks, with many weird and grotesque-shaped rocks that have been eroded by the elements over many thousands of years. The rock outcrops here cover between 50-60 acres of the moorland. These weathered rocks, boulders and tors have, probably since the Victorian Age, been given strange names – many looking like animals – others like the devil, druids and even Mother Shipton. A carpark is provided for visitors near to Brimham House (now The National Trust visitors Centre) with numerous paths weaving in and out around the rocks, which are surrounded and partly hidden by birch trees, bracken and heather. The site is now owned by The National Trust Estate. Brimham Rocks are 3 miles to the east of Pateley Bridge on the B6265 road. The millstone grit outcrops on Brimham Moor were first laid down in geological terms some 400 million years ago, but the erosion and weathering only actually began in somewhat more recent times – to be precise some 18,000 years ago during one of the Ice-Ages. Glaciation and sedimentation first played its part, then the elements like rain wind and frosts began to slowly weather the rocks into the strange grotesque shapes that we see today, and this has been going on since that time. The huge rocks have gradually formed themselves into pinnacles, buttreses, tors and crags – some of them being 50 feet high and weighing up to 200 tonnes. Here we can see some of the most odd-shaped rock formations in the north of England. The most famous being the 15 foot high Idol Rock, also called ‘The Druids Idol’ or ‘The Druid’s Writing Desk’ which sits or pivots on a lump of rock only 1 foot in circumference, looking like it could fall over at any moment! But it dosen’t. The Turtle Rock or ‘Eagle Rock’ is also quite a distinctive shape as are The Leaning Tower Rock and Elephant Rock, but so too are the so-called ‘Sphinx Rock’ (Dancing Bear), ‘Crown Rock and Kissing Chair’, ‘The Knob’ and ‘Anvil Rock’. There are also rock formations that resemble the devil and Mother Shipton, a 17th century prophetess who lived in a cave beside the river Nidd at Knaresborough. So did she ever visit Brimham Rocks? And one of the rocking stones apparently has some prehistoric cup-marks near its base, which would suggest that Neolithic tribes inhabited the area and probably recognised it has being a sacred place. Rock climbers used to be able to climb the rocks and tors but I don’t know whether they are still allowed to do that today? But people do still attempt to stand or sit on top of some of the more accessible outcrops and rocks in order to get a good view of Nidderdale and the surrounding areas. Poucher, W.A., The Peaks & Pennines, Constable, London, 1973. Rawson, Jerry., Hidden Gems – Dalesman (Vol 66 No.11), Dalesman Publishing, Skipton, North Yorkshire, 2005. Categories: Brimham Rocks In North Yorkshire, Naturally Formed Rocks | Tags: Brimham Rocks near Summerbridge in North Yorkshire | Permalink. You post amazing articles… This is great! Thank you so much evastatherou that’s very kind of you. Best wishes, Ray.